This Chef of Summer has a favorite baseball season hot dog and it is a Chicago Dog -- done in the Pink's manner. I prefer hot dogs and buns steamed like they do at Pink's hot dog stand in Hollywood - when I catch their line shorter than a dozen people he will quickly pull over and order a Chicago Spicy Polish -- a perfectly steamed sausage with a juicy snap to the skin when bit, and piled high with lettuce and tomato. 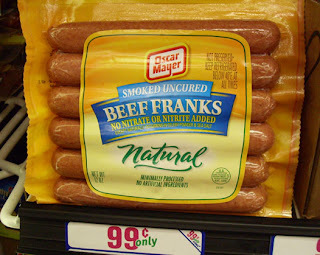 99c only Stores carry all the necessities for this summertime ballpark classic, including many varieties of hot dogs; from chicken to beef, and even on occasion kosher and "natural" -- in sizes regular and jumbo. Traditional yellow mustard, relish, buns, lettuce and tomato fill out all the ingredients needed for a Pink's Chicago dog. Other hot dog toppings carried by 99c only Stores include: sauerkraut, chili with or sans beans, cheese and sometimes bacon. Now for all you purists out there, I knows a proper Chicago dog is constructed on a poppy seed bun with vinegary serrano "sports" chiles, day-glow green relish, sliced tomato, a wedge of pickle, and no lettuce - I drove through Chicago once, but did not have time to stop at Fluky's for the city's namesake hot dog. Go here for a classic Chicago dog recipe. To find traditional Chicago dog locations locally, read the entertaining citywide search by Jonathan Gold, L.A. Weekly's Pulitzer Prize - awarded food writer, here. Mom used to warn the Chef behave at the dinner table, but this hard-headed cook breaks the rules and takes playing with your food to a whole new level with this freshly cooked up video (watch for the "fowl" ball.) 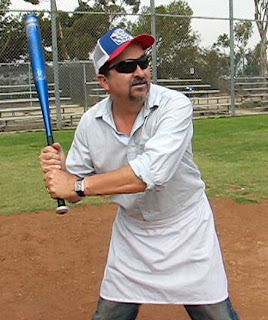 The Chef also pulls from the bullpen a couple of 99 Cent Players: Pete and the "Ump." These talents fire up the crowd with their 9th inning antics. 99 thanks to my neighbor the "Ump." So crack open a beer, put mustard on your hot dog while the Chef and his 99 Cent Players take the field to entertain you! Play it here. The video runs 3 minutes 10 seconds. Steam covered hot dogs on a steamer rack above a couple of inches of water until plump, about 10 minutes. 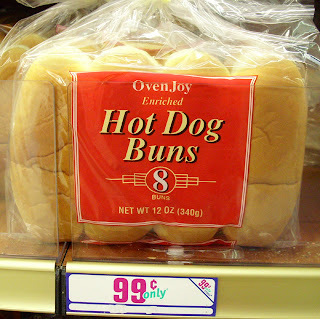 Steam buns with hot dogs for about a minute; check on bun so it doesn't become soggy. Assemble with mustard, relish, lettuce and tomato. To view or embed video from youtube click here. I read your cool blog and then go to the 99 cent store here in Vegas. They never have the great stuff you get in L.A. Maybe I should move. Vons had pork ribs for 99 cents a lb last week. Cooked them in a crock pot with 1 can of hominy, 1 can of green chiles, 1 can of chicken broth and served with tortilas. All from 99 cent store. Yum. Hi Carolyn, I was wondering what to do with those large cans of hominy, thanks for the recipe tip. I've found 99c only Stores are not stocked the same, even in the same zipcode.